Reading goalkeeper Adam Federici has been named as the FA Cup "Player of the Round" for the fifth round. The Australian received 38% of supporters' votes on the FA's official website, after his heroics in the Royals' 1-1 draw at Manchester United. The four other players nominated were Blackburn's Brad Friedel, Tottenham's Robbie Keane, Plymouth's David Norris and Middlesbrough striker Yakubu. 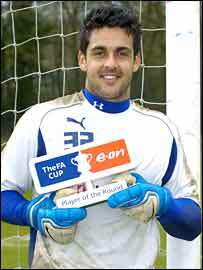 Federici joins eight previous winners in the "Team of the FA Cup". The "Team of the FA Cup" so far comprises Matt Lewis (Halesowen Town), Gary McPhee (Nuneaton Borough), Byron Bubb (AFC Wimbledon), Paul Booth (Lewes), Kris Commons (Nottingham Forest), Phil Jevons (Bristol City), Jason Puncheon (Barnet), Jamie McAllister (Bristol City) and Federici.